The La Fayette class (also known as FL-3000 for "Frégate Légère de 3,000 tonnes", or FLF for Frégate Légère Furtive) are general purpose frigates built by DCNS and operated by the French Navy. Derivatives of the type are in service in Saudi Arabia (Royal Saudi Navy), Singapore (Republic of Singapore Navy) and Taiwan (Republic of China Navy). The ships were originally known as "stealth frigates" due to their unique stealth design at the time. Their reduced radar cross section is achieved by a clean superstructure compared to conventional designs, angled sides and radar absorbent material, a composite material of wood and glass fibre as hard as steel, light, and resistant to fire. However, most modern combat ships built since the introduction of the La Fayette class have followed the same principles of stealth. All information gathered by the onboard sensors is managed by the Information Processing System, the electronic brain of the operation centre of the ship. It is completed by an electronic command aid system. The La Fayette class has space available for the future installation of the Aster 15 air-defence missile, however they will not be installed due to recent cost issues. The ships are designed to accommodate a 10-tonne helicopter in the Panther or NH90 range (though they are also capable of operating the Super Frelon and similar heavy helicopters). These helicopters can carry antiship missiles AM39 or AS15, and they can be launched during sea state five or six due to the Samahé helicopter handling system. France ordered five ships of the La Fayette class in 1988, the last of which entered service in 2002. They may be replaced in French service by five frégates de taille intermédiaire (FTI, "intermediate size frigates") starting in 2023. 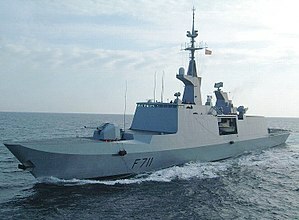 In the late 1980s, the Marine Nationale started the studies for frigates adapted to low-intensity conflicts in the post–Cold War era. The ships were to serve in the large French exclusive economic zone (EEZ), be adapted to humanitarian operations or low-intensity operations in support of land troops, and replace the aging D'Estienne d'Orves-class avisos, which tended to prove too focused on naval operations and were ill-suited for joint operations. Conventional warships used in low-intensity or humanitarian relief operations proved costly, with their heavy equipment and large crew. Hence came the requirement for lightly armed frigates with economical engines and small crew. In Italy, the same requirements led to the development of the Cassiopea and Minerva type corvettes, built according to both civilian and military standards. These ships were limited to 1,300 tonnes because the limited size and depth of the Mediterranean and the proximity of the homeland. The French Navy, on the other hand, had to be present in overseas territories, bases and EEZ. To be enduring enough, the ships had to reach 3,000 tonnes, the size of a frigate. The larger displacement allows combining strong firepower (like the Minerva class) and a capacity for a medium helicopter (like the Cassiopea class), along with a good autonomy and seaworthiness. The first type of ships built on these principles were the Floréal-class frigates, built on civilian standards, with a limited armament, and carrying a medium helicopter. These ships are high endurance units designed to be operated in overseas possessions (the Caribbean, Polynesia, and New Caledonia) and the EEZ, where the likelihood of a naval threat is low. The speed is limited to 20 knots because of the low-power engines which emphasises autonomy and reliability. To fight pirates in fast rigid-hulled inflatable boats, the Floréals rely on their onboard helicopter and marine detachment. The niche for more hostile environments is covered by the La Fayette type, designed to operate in complex zones like the Indian Ocean or Djibouti. These ships were to be able to secure the EEZ, but also to operate in naval groups or intelligence gathering missions. The intended role for the ships was in fact very varied, because the experience of the C.70 class, with an intended 20 ships cut down to only nine (the seven Georges Leygues-class frigates and two Cassard-class frigates) had taught that project downsizing and reorganisations could lead to badly balanced naval capabilities. The new ships were to benefit from breakthroughs on stealth ("furtivité") achieved by the DCN in the 1980s. It took several years to refine the concept, and the first ship was eventually launched in 1992, two years after the final design was completed. Weapon system testing took place in 1994, and particularly extensive trials were undertaken to prove the structure of the ship under a wide range of conditions. La Fayette was eventually commissioned in March 1996. At the time of their commissioning, the units of the La Fayette class were the state of the art in stealth for warships. The shape of the hull and the superstructures is devised for the optimal reduction of the radar signature, which has been reduced by 60 percent: a 3000-tonne La Fayette unit has the typical radar signature of a 1200 tonne ship. Stealth is achieved with inclined flanks, as few vertical lines as possible, and very clean lines and superstructures: stairs and mooring equipment are internal, and prominent structures are covered by clear surfaces. The superstructures are built using radar-absorbent synthetic materials. Their radar cross-section is equivalent to that of a large fishing boat, which can make camouflage among civilian ships possible; or that of a much less capable corvette, which could lead an enemy to underestimate the capabilities of the ship. In case of a direct attack, the small radar signature helps evade enemy missiles and fire control systems. The La Fayette's are also equipped with jammers that can generate false radar images, as well as decoy launchers. Further point missile defence will be provided when the ships are equipped with the Aster 15 antimissile missiles. Thanks to the adoption of low-power diesel motors and a special heat dissipation system, the La Fayette ships have a low thermal signature. The usual funnel is replaced with a small sets of pipes, aft of the mast, which cool the exit gas before it is released. The ships usually operate in warm areas, which further decreases the thermal contrast with the environment. The magnetic signature is reduced by the presence of a demagnetisation belt. The acoustic signature is minimized by mounting the engines on elastomeric supports, which minimize vibration transfers to the hull, and by rubber coatings on the propellers. The La Fayette's are equipped with the Prairie Masker active acoustic camouflage system, which generates small bubbles from underneath the hull to confuse sonars. The superstructure is made of light alloy and glass-reinforced plastic, which allow a reduction in top weight. This provides adequate but sub-optimal resistance to fire. Vital zones are armoured in Kevlar, and important systems are redundant. The crew is protected against biological, chemical and nuclear environments. The ships were built with a modular inner structure from eleven prefabricated modules which were completed at the factory, delivered to the shipyard and assembled there. This technique results in a construction time of less than two years. The hull has a pronounced angle at the stem, with a short forecastle that integrates directly into the superstructure. The ship's sides have a negative inclination of ten degrees. The single anchor is located exactly on the stem, into which it is completely recessed. The deck where the seamanship equipment and capstans are installed is internal in order to hide it from radar. The superstructure is built in one piece and directly integrates into the hull, with only a change in inclination. A platform is located between the main gun and the bridge. The superstructure runs continuously down to the helicopter hangar, on top of which short-range antiaircraft Crotale missiles are installed. The ships feature two masts. The main mast has a pyramidal structure which integrates funnels and supports the antenna of the Syracuse military communications satellite system, while the second supports the main radar. The three Al Riyadh-class ships are an expanded anti-air version of the French La Fayette class, displacing about 4,700 tonnes and extended to 133m in length. The ships' combat systems are produced by Armaris (a DCN/Thales joint venture) and are armed with the Aster 15 missile. The Aster missiles use the DCN SYLVER launcher. As with the La Fayette class the primary offensive weapon is the anti-surface Exocet missile. The ships' main gun is the Oto Melara 76 mm/62 Super Rapid gun replacing the 100 mm TR automatic gun. There are also four 533-millimetre (21.0 in) aft torpedo tubes. The ship is armed with the DCNS F17 heavyweight anti-submarine torpedo. The ships are capable of a maximum speed of 24.5 knots (45.4 km/h; 28.2 mph) with a maximum range of 7,000 nautical miles (13,000 km; 8,100 mi). 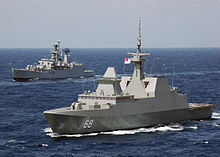 The Republic of Singapore Navy's six Formidable-class frigates are of comparable size to the La Fayette class but differs from that class and the Saudi Al Riyadh class in the armament carried: in place of the Exocet is the Boeing Harpoon. The main gun is a stealth cupola equipped with an Oto Melara 76 mm gun replacing the 100 mm TR automatic gun. The Formidable class also uses the SYLVER launcher/Aster missile combination. The first ship, RSS Formidable, was built by DCN, while the remaining ships were constructed by Singapore Technologies Marine. Anti-submarine capability includes S-70B Seahawk helicopters. Maximum speed is 27 kn (50 km/h; 31 mph), making it the fastest variant. The ships have a maximum range of 4,200 nmi (7,800 km; 4,800 mi). As the ROC (Taiwan)'s defensive stance is aimed towards the Taiwan Strait, the ROC Navy is constantly seeking to upgrade its anti-submarine warfare capabilities. The US$1.75 billion agreement with France in the early 1990s was an example of this procurement strategy: the six ships are configured for both ASW and surface attack. The Exocet was replaced by Taiwan-developed Hsiung Feng II anti-ship missile and the AAW weapon was the Chaparral. 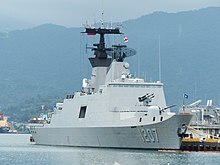 The main gun is an Oto Melara 76mm / 62 mk 75 gun, similar to its Singaporean counterparts, the Formidable-class frigates. Some problems in the integration of Taiwanese and French systems had been reported. The frigate carries a single Sikorsky S-70C(M)-1/2 ASW helicopter. The antiquated Chaparral SAM system is considered inadequate for defense against aircraft and anti-ship missiles, so the R.O.C. (Taiwan) Navy plans to upgrade its air-defense capabilities with the indigenous Ship-Based Tien Chien II N/Sky Sword II N in 2020. The class's maximum speed is 25 kn (46 km/h; 29 mph) with a maximum range of 4,000 nmi (7,400 km; 4,600 mi). The six ships of the class are named Kang Ding (康定, FFG-1202), Si Ning (西寧, FFG-1203), Kun Ming (昆明, FFG-1205), Di Hua (迪化, FFG-1206), Wu Chang (武昌, FFG-1207), and Chen De (承德, FFG-1208) respectively, after provincial capitals in mainland China under ROC's pre-1949 political division. The Taiwan frigate deal was a large political scandal, both in Taiwan and France. A former French foreign minister claimed that up to US$500K was paid by Thomson-CSF (now Thales), the prime contractor, as a "sweetener", as the ships did not strictly meet Taiwan's requirements. Eight people involved in the contract died in unusual and possibly suspicious circumstances. Six ROC naval officers were indicted on corruption charges relating to the affair. In 2003, the Taiwanese Navy sued Thomson-CSF (Thales) to recover alleged $590 million in kickbacks, paid to French and Taiwanese officials to grease the 1991 La Fayette deal. The kickback money was deposited in Swiss banks, and under the corruption investigation, Swiss authorities froze approx. $730 million in over 60 accounts. In June 2007 the Swiss authority returned $34 million from frozen accounts to Taiwan, with additional funds pending. ^ "Future of the French Navy: through the storm, but without glory". Combat Fleets Of The World. 12 May 2010. Retrieved 30 October 2015. ^ "Update to French Military Planning Law Means New Capabilities for Lafayette Class Frigates". navyrecognition.com. 21 May 2015. Retrieved 30 October 2015. ^ a b "Al Riyadh (F3000S Sawari II) Class, Saudi Arabia". www.naval-technology.com. Retrieved 30 October 2015. ^ Schofield, Hugh (1 December 2003). "Book delves into frigate scandal". BBC News. Retrieved 30 October 2015. ^ "Navy sues French frigate contractor". Taipei Times. 7 November 2003. Retrieved 30 October 2015. ^ "Lafayette scandal funds returned to Taiwan". Taipei Times. 15 June 2007. Retrieved 30 October 2015. Wikimedia Commons has media related to La Fayette class frigates.